The use and misuse of Trinity Bellwoods Park has been an ongoing and complex issue. To further the dialogue between the park users, nearby neighbors and the city, there are two meetings that are happening this week. Both are are open to the public. Trinity Bellwoods Recreation Centre. (second floor hallway). In attendance will be Park Ambassador Troy Ford, Parks, Forestry & Recreation, Councillor Layton’s Office, Permits, the Supervisor of Community Centre, representative from 14 Community Response Unit, the TBCA, and Friends of Trinity Bellwoods Park. Some of the topics being discussed: Drinking, Animal complaints, Park Curfew, Common misuse of park. Rosario Marchese is inviting concerned citizens to participate in an action that will target an existing loophole in the Rental Tenancies Act that allows many landlords to dramatically raise rent. Please join Rosario Marchese to learn how you can take action to strengthen tenants’ rights and protections. We will discuss Cindy Forster’s bill to reform the Residential Tenancies Act, why individual activism is needed, and how the government’s Act falls short. And we will discuss what you can do to put real reform back on the government’s agenda. For more information, see Rosario’s blog posting: Close the Tenant Protection Loophole. The City of Toronto is launching a new program to help property owners who are victims of graffiti vandalism. 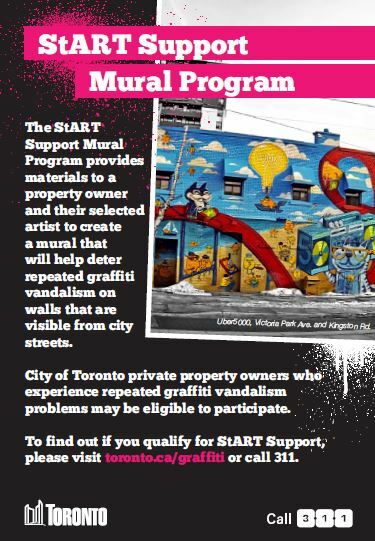 The StART Support Mural Program will provide materials for the creation of art murals and graffiti art on walls visible from city streets that have a history of repeated graffiti vandalism. The City will provide exterior paint in a full colour spectrum, application materials like brushes, rollers and paint trays and artistic quality spray paint, available in a variety of colours. The property must be located within the City of Toronto. Property owners must hire an artist independently and pay for any other costs related to the project, like equipment rentals or permits, if they are required. The StreetARToronto Artist Directory www.toronto.ca/streetart may be a helpful tool to find an artist. Though well used, most of Toronto’s laneways don’t have a name. Ward 19 is no exception. If you have ever tried describing the location of something located in an unnamed lane, you’ll know that isn’t easy. This is especially troublesome if you need to report a fire or some other emergency taking place in a neighbourhood lane. TBCA and Councillor Mike Layton would like to invite you to help name these lanes. To participate: send your thoughts, ideas and comments to TBCA Chair Chris Walker chris.walker@trinitybellwoods.org or Ashley Da Silva adasilv2@toronto.ca from Councillor Layton’s officee. To read more, see an open letter from Chris Walker and Mike Layton: Name Your Lane Project. In the News: An article on the “Name Your Lane Project” was featured in the Toronto Star. To read the article, click here.